Jodi Stone is an amazing blogger all the way on the other side of the country. We have been friends for many years and we didn’t even meet in person until a couple of years ago when she drove two hours to see me speak at a conference in Rhode Island! Yup, she’s that kind of awesome friend. I was so excited when she asked me if I could help her with her blog. We both share a love of dogs and her blog is one of the most entertaining ones that I read, so of course I jumped at the chance to work with her! 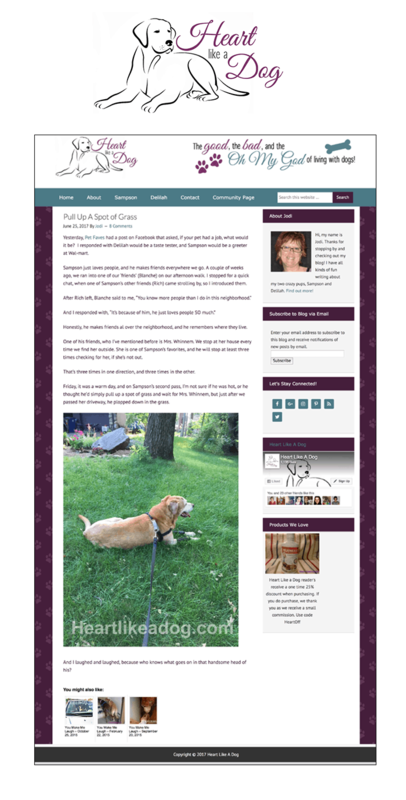 She has two adorable labs, Sampson and Delilah and if you’re in need of a good laugh, you’re always sure to find one on Jodi’s blog. Jodi was fun to work with and we both felt like we pretty much nailed what she was hoping for. It’s been awhile, so I have a feeling we may be up for a little refresh and I can’t wait to work with her again!